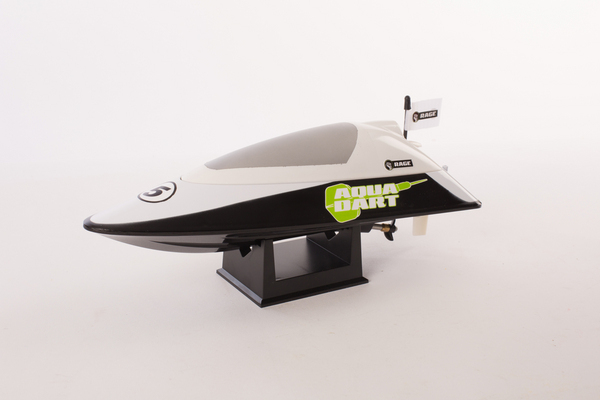 The Aqua Dart is a simple, economical way to have RC boating fun at the local pond or swimming pool. Quick, fast turns are a huge part of what makes the Aqua Dart fun to own, even in restricted areas like medium to big swimming pools. Tight turns normally lead to capsizing for most RC boats, however not this one. Even when aggressive driving produces a roll-over, there's nothing to stress over since the Aqua Dart will completely right itself within seconds! Plus, with its water-proof electronic devices even if some water does go into the hull there's nothing to stress over. Even better, its durable ABS plastic Unibody design guards against damage from swimming pool walls or other floating challenges, ensuring your Aqua Dart continues running with barely a scratch. 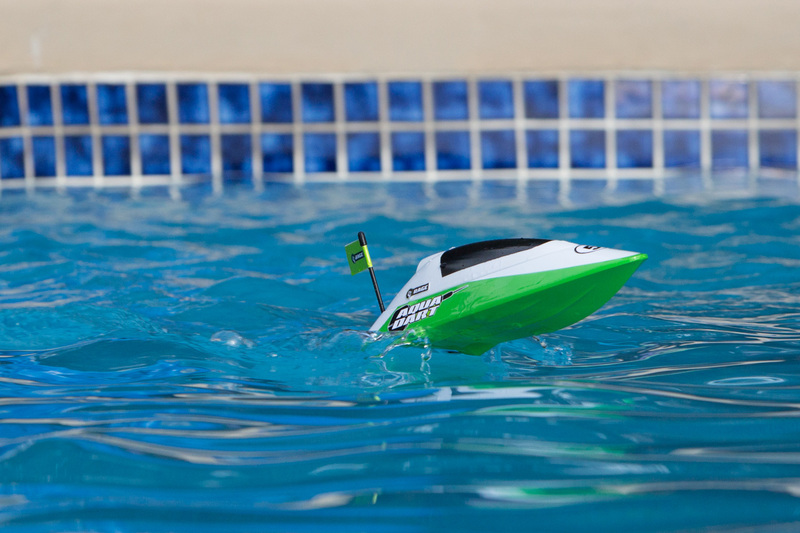 The Aqua Dart is readily available in your choice of two vibrantly colored trim alternatives so you can quickly determine your boat when racing with a pal. 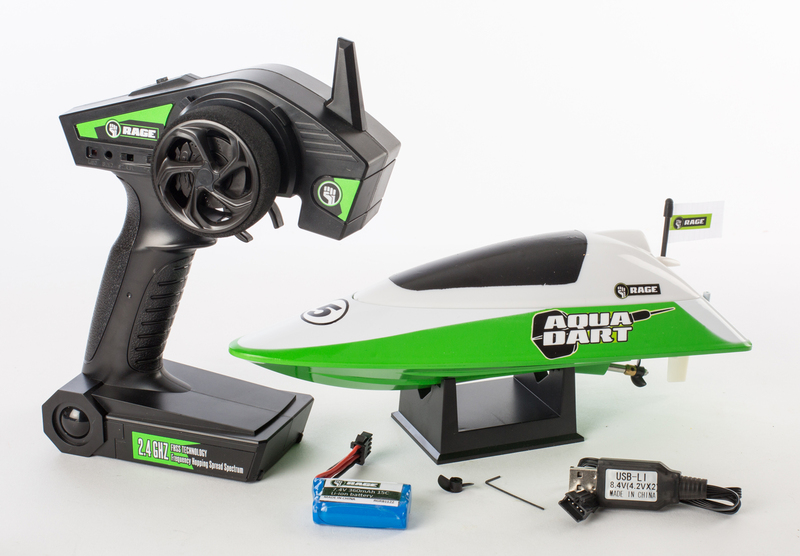 Given that it's an RTR (Ready-To-Run), when you open the box you'll discover a 100% factory-assembled and embellished boat, a 2-channel, 2.4GHz radio with proportional controls, a 7.4V 360mAh Li-ion battery and a battery charger that conveniently plugs into any USB outlet. This complete bundle even includes a display screen stand so you can proudly display your new boat. 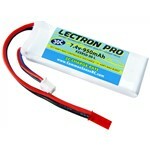 The only thing required for conclusion is 4 AA batteries for the transmitter and an appropriate pond or swimming pool so you can run your Aqua Dart within minutes of opening the box. With all of these functions in readily available one convenient box, the Aqua Dart is easy and fun to run in addition to delivering a fantastic value. 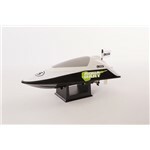 Even if this is your first RC boat, you'll be astonished at how easy it is to be "darting" around the water in no time!